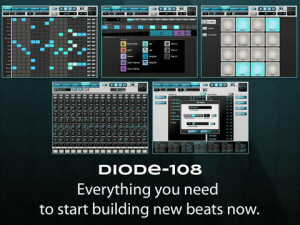 DIODE-108 is a drum machine packed with built-in vintage, classic, and acoustic kits and it now has MIDI sync. You can easily mix and match the samples provided to make your own custom kits. Import wav files for even more variety. * Drag and drop effects let you put effects on individual beats! * Drum kits licensed from respected partners. Dubsounds, Samples From Mars, Orange Tree Samples, and 99Sounds. * Mix and Match kits (easily substitute any sample in any kit). Want an 808 kick in a 909 kit? No problem. * Kit Load and Save. Share kits with your friends! * Song In/Out markers. Work on any section! Build your beat on a 16×16 pattern grid. 16 voices is almost twice the number of voices of some of our competitors, and it means that you can have an 808 kit with all the instruments you’re looking for (not just some of them). Set tempo and swing. Several time signatures are supported (and each pattern can have its own). Tap your beat on our 4 by 4 array of drum pads. Record into the active pattern, or just play along. Unprecedented control over your drum kit. Dial in the settings you want, mix and match samples from different kits, and save out your modified custom kits for use in any song. How much control do you have? An amazing 7 dials for each of the 16 drum voices! 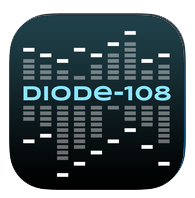 Diode-108’s crown jewel is its drag-and-drop beat FX. Want a reverse cowbell? Want a bitcrushed tom? Want a cymbal that performs a pitch dive across several beats? Just drag and drop the effect tokens onto beats, and drag them left and right to cover any beats you like. Turn a long-lasting cymbal into a rhythmic backbone. You have to hear it to believe it! Head over to http://www.vibrantdigitalengineering.com for SoundCloud examples. Build up a collection of named patterns from scratch, or import selected patterns from existing songs. Then drag and drop the patterns to build up a song. Each pattern can have its own swing setting and tempo multiplier if you like! Export your songs as wav files to SoundCloud, DropBox, or iTunes, or send them through Audiobus to other apps on your iPad.